Princeton University’s microgrid is now noted worldwide for its resilience and sophistication. The facility more than proved its worth when Superstorm Sandy lashed the eastern United States in October 2012. Over eight million electric customers lost their power. But the university was able to continue to power its essential buildings and operations. During the storm, the university was a beacon of light because of its microgrid – and the strategic vigilance of those who operate it. Seeing trouble coming as the storm bore down on New Jersey, the energy facility islanded, or disconnected, from the local utility, Public Service Gas & Electric. “We have four electrical feeders that come into the campus. We lost two and kept losing voltage for a fraction of a second. We knew the utility had problems. So we shed load and became an island,” said Tom Nyquist, executive director for engineering and campus energy at Princeton. With its connection temporarily cut to the utility, Princeton was protected from the damage that was taking down the larger grid. The campus continued to receive power from its on-site 15-MW combined heat and power plant, part of a microgrid that includes district heating and cooling, chilled water, thermal storage, a 5.4 MW solar photovoltaic farm, and an advanced control system. The facility serves a campus community of 12,000 people across about 150 buildings. Sandy made this microgrid newsworthy. But perhaps more impressive is how Princeton interacts with the grid on typical days. The Princeton facility is a hybrid microgrid, meaning it can operate in island mode or connected with the central grid. The university only islands during emergencies. It prefers remaining connected because the relationship offers value to both the university and the grid. For the university, the benefits are both operational and financial. Princeton can rely on the grid for back-up power should its own equipment fail. The university also can hedge its power purchases based on real-time prices in the PJM Interconnection’s wholesale market. When wholesale prices are low, Princeton buys grid power; when power prices are high, it generates more power onsite. In addition, the facility limits the amount of power it buys during the hours of the year when demand is highest in PJM. “So by reducing our load, we reduce our capacity payment to PJM, and we reduce the stress on the grid. So that’s a win-win for both the grid and us,” Nyquist said. This mutually beneficial relationship exists because of the way PJM handles pricing. PJM “carves up the price you pay, recognizes the different aspects of power, and charges for it more or less proportionally to how you use it,” said Edward “Ted” Borer, the university’s energy plant manager. As a result, PJM is viewed as one of the more favorable markets for microgrids in the U.S.
Princeton also sells into PJM’s ancillary markets, offering the independent system operator frequency regulation and synchronous reserve services. “We don’t look at the utilities or the ISO as the opposition. In a lot of ways we are shoulder to shoulder. A lot of our work is synergistic,” Borer said. So what story does Princeton’s microgrid ultimately tell? A microgrid can tap into the best of many worlds. It has the flexibility to get out of the way and self-generate when the central grid is in trouble; the onsite resources to ease pressure on the grid when power is in high demand; and the sophistication to engage in real-time power purchase management to leverage best economics. 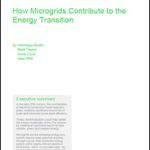 The bottom line is more reliability and lower energy costs for the microgrid and the central grid. It’s a compelling argument for more microgrids.